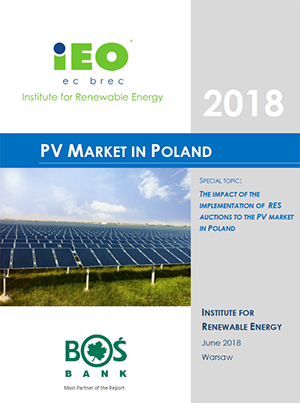 The Institute for Renewable Energy published the sixth edition of the report "PV Market in Poland '2018" - special topic: The impact of the implementation of RES auctions to the PV market in Poland. The report identifies three models of electricity sales to the network in which polish market is basically based and the corresponding business variants. It is an renewable energy auction system and a prosumer system, which are official instruments supported by the state and are to help Poland meet international commitments related to obtaining a 15% share of energy from renewable energy sources (RES) in energy consumption in 2020, and a business autoproducer system that, due to rising energy electricity prices for companies, is developing on market principles. Basically, the report focuses on the RES auction model as the most forward-looking one. 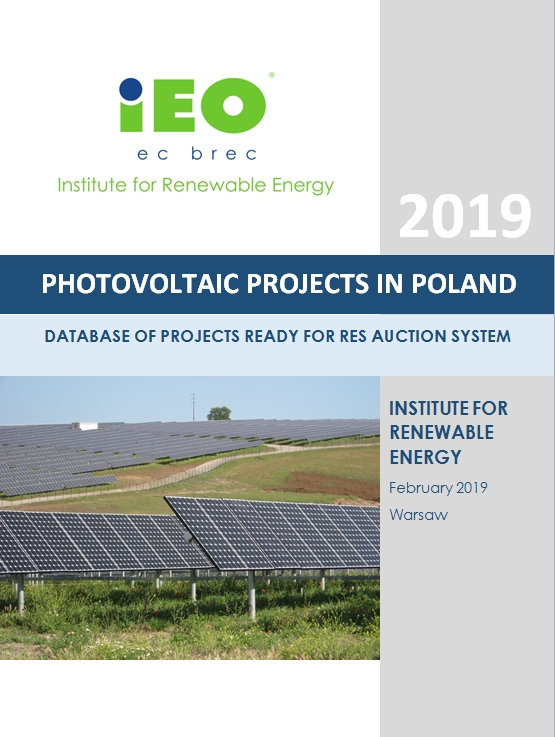 Investments under the auctions for energy from RES will soon dominate the Polish PV market. So far, only two auctions for energy from renewable energy have been held. The first took place at the end of December 2016, while the second was held in June 2017. In total, in the first auction, for new solar and wind farms with a capacity below 1 MW, they won 84 offers, in the second auction 352 (the number increased fourfold). As a result of pilot auctions until 2020, approximately 360 MW of new capacities will be created. Until the end of May 2018, 40 PV installations started to produce energy (less than half of the projects from the first auction) with a total capacity of 27 MW. Considering the estimated volumes in the amendment of the Act on Renewable Energy Sources adopted by the government in a new auction basket dedicated to solar farms and wind farms, as a result of this year's (probably third quarter) auction for renewable energy, a further 750 MW of new capacities may be installed in PV installations. Not all projects in the auction system will be implemented within the maximum currently allowed 24 months, but by the end of 2020, the cumulative power in all solar systems may exceed 1.2 GW. It would be a rapid upsurge in power increase in relation to current moderate growth. 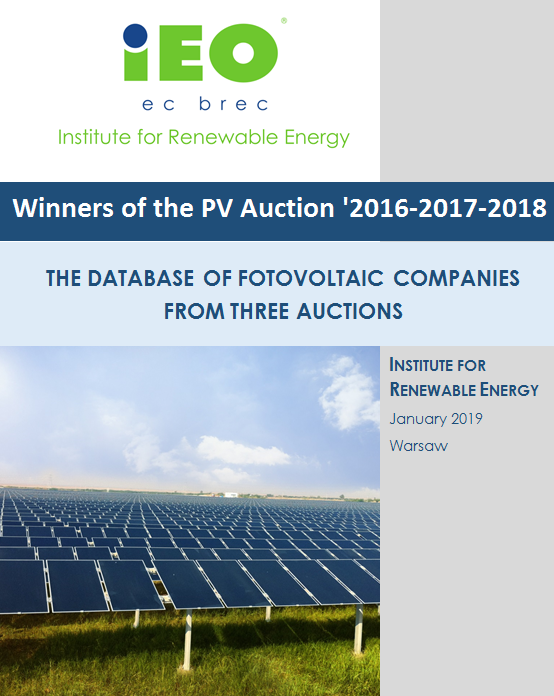 At the time of publication of the report the total installed capacity in PV was approximately 300 MW (taking into account PV installations completed in the system of certificates of origin, solar farms already built (by the end of May 2018) in the auction system as well as micro installations (prosumer installations) built in 2013-2017). The figure illustrates the planned development of PV installations by 2020 with the scenario of possible reinforced support. The maximum value of energy (introduced into the network over the next 15 years) which the state plans to buy in this year's renewable energy auction is 16.2 billion EUR. The scale of investments in solar farms alone in 2019 may exceed 0.7 billion EUR. Such large investments in the PV sector, with periods for their implementation shortened by the legislator (from 24 to 18 months) and other restrictions of the auction system, are not only a challenge for engineering companies like "EPC" serving investors, but most of all are a challenge in terms of financial security. An intervention auction for all types of RES, which would guarantee the start of energy production in the first quarter of 2020 at the latest, announced at the beginning of 2019. A system of guaranteed tariffs for all types of micro-installations for households and SMEs, introduced, at the latest, in the first quarter of 2019, with a guarantee (for those who will be able to join the network in the aforementioned date) of maintaining a fixed price for 15 years. 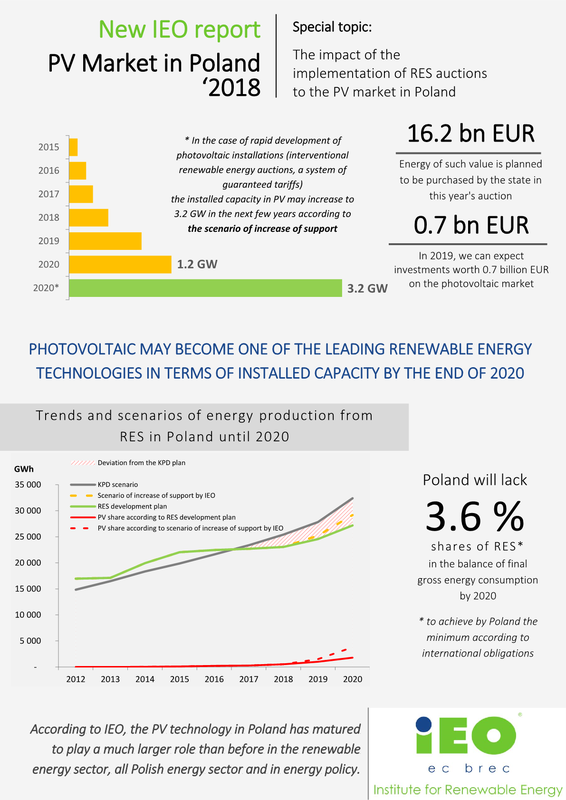 In the wake of these activities, support instruments for the development of the domestic photovoltaic industry, intelligent energy network technologies and renewable energy based electromobility should be launched and the inclusion of photovoltaics in the new energy policy of Poland much wider than in the present decade.